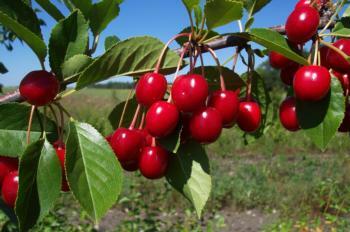 Sweet Cherries: Bing, Black Tartarian, Coe’s Transparent, Craig's Crimson (self-fertile), Index (self-fertile), Lapins, Rainier, Republican (Black Republican or Black Oregon), Stella, and Van. Verify number of chill hours based on your location, and note that unless indicated, Sweet Cherries require a second pollinator - a compatible variety planted nearby or grafted onto the fruiting tree. Sour Cherries: English Morello, Montmorency, and North Star.